The other night we were watching the news and I was knitting. 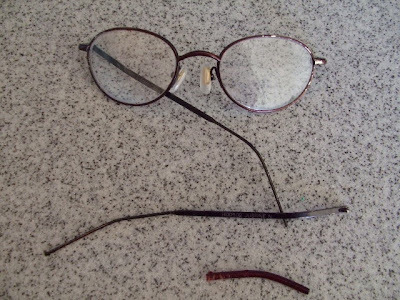 I had to get up and do something, and when I came back, I couldn't find my reading glasses. I looked everywhere I could possibly have set them down, and even on the floor in case Jackson had grabbed them, but they were nowhere to be seen. 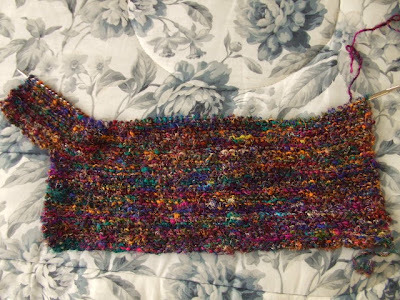 I finished out the news knitting on the Sonnet without them (it's just garter stitch; nothing fancy or difficult). On the other hand (one must focus on the postive, right? 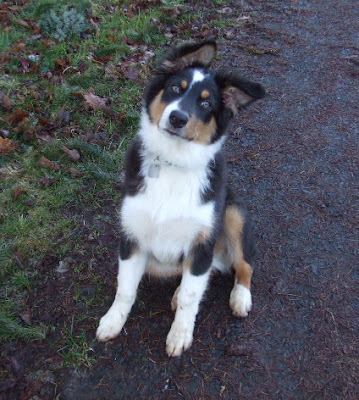 ), he is handsome, smart, affectionate and athletic. Doesn't he look like he knows it? 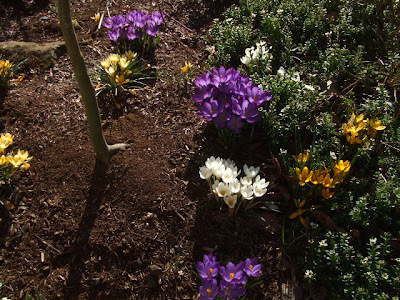 Two days ago, my crocus were at their most glorious ever, with all three colors showing off at once under a dormant Japanese maple. It's raining right now, and they look like wet tissue paper. But thanks to digital photography, I can revisit their beauty whenever I want - and share it with you! Behold, today's haul! 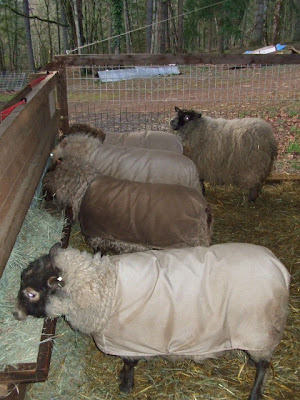 From front to back are the fleeces of Braveheart, Brava, and Bella. 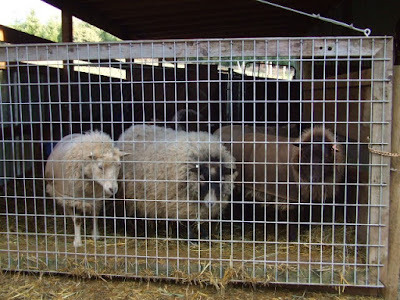 I decided to wait on shearing the three hopefully-bred ewes, since they only have six months' growth and I like longer fiber to work with. 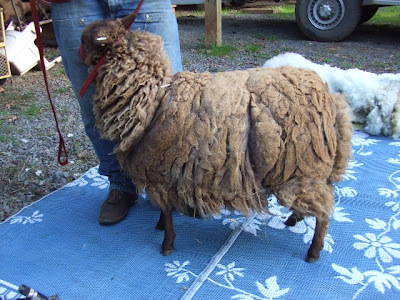 I'm always interested to see what my Shetlands REALLY look like under all that wool. Just in case I'm not the only one who is curious, I try to get before and after photos. 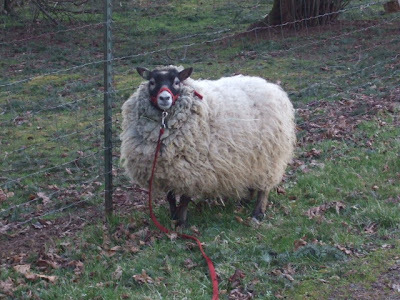 The sheep are not always in the most attractive poses, but I don't want to tax my farrier/shearer's patience by being picky. 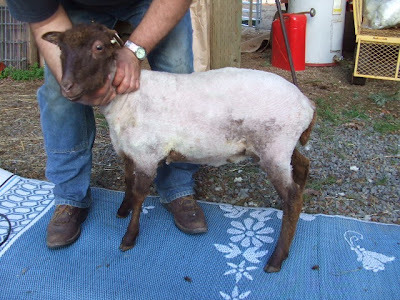 Here's Braveheart, before and after: He is still a little guy (after shearing I put a size C Rocky Sheep Suit on him! 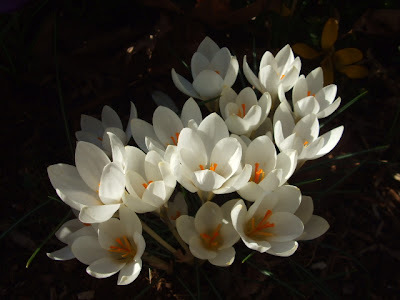 ), which for my management purposes and breeding goals is just fine. However, it will almost certainly put him at a disadvantage in the show ring, so I'll have to think about whether to enter him at the Black Sheep Gathering in June. 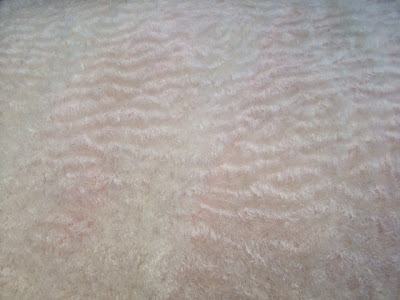 A fascinating discovery when all Braveheart's fine, crimpy fleece was removed: a lovely corrugated pattern! I read on one of the Shetland lists that this corrugated pattern often corresponds with a finer fiber, so I was tickled to see it on one of my sheep for the first time. Last in line was my Brava girl. She was lighter at the skin than I thought she'd be, but shows some interesting dark spotting at both flanks. 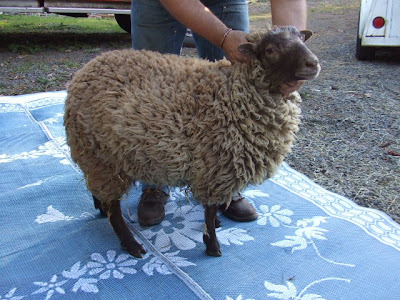 Her fine, crimpy fleece is very dense, and she is even more heavily corrugated than Braveheart. 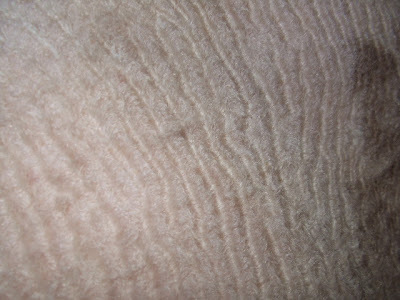 The shearer commented that she has a lot more wrinkles than the others; interesting. 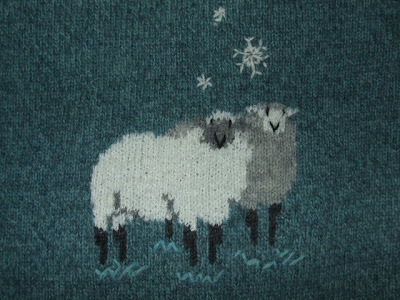 I MUST find time to work with her wonderful fleece! I finished the dark chocolate Pitt Island hoggett. Next fiber up: Romney. 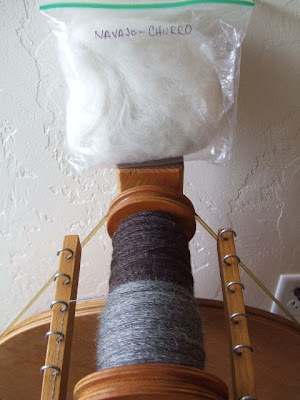 The Romney and one other fiber in the sampler Kathy sent are washed locks, not prepared fiber, so I need to flick-card it before I can spin. Here is a lock: Here is the same lock after flick-carding. Am I the only one amazed at how much this stuff "grows"? I left the sheep in this morning because it was cloudy and the shearer is coming this afternoon to give some of them haircuts. They were happy enough while "bellying up to the bar," but after the grain was gone they were wondering, "What gives?" 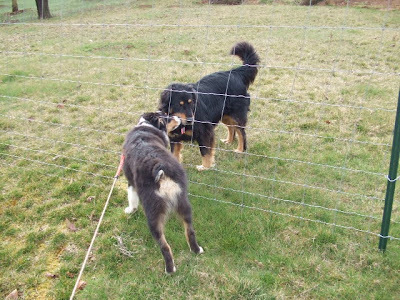 By the way, the wire in that gate they are standing at used to be my "skirting table." I'm going to have to figure out something else to use - quick! I feel like a broken record, posting about the same three topics all the time. 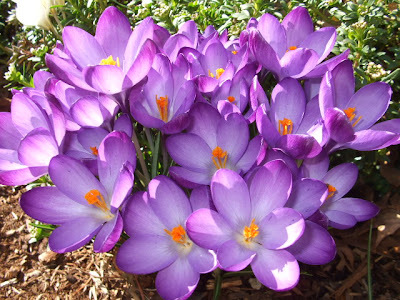 But it's hard to beat a good dog, fun fiber experiences, and beautiful blooms popping up here and there! 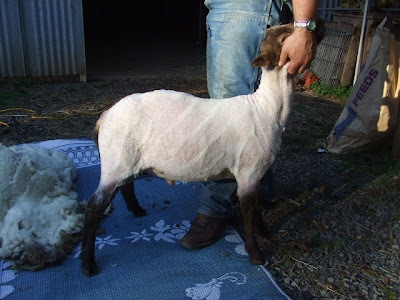 I do promise to post sheep photos later this week; shearing day for part of the flock is Wednesday. 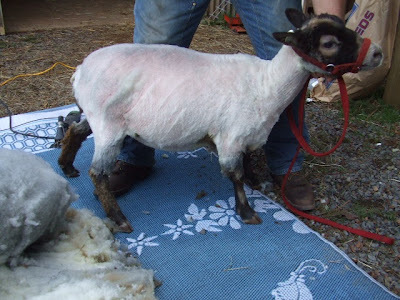 I am anxious to see what Braveheart and Brava look like under their lamb fleeces! 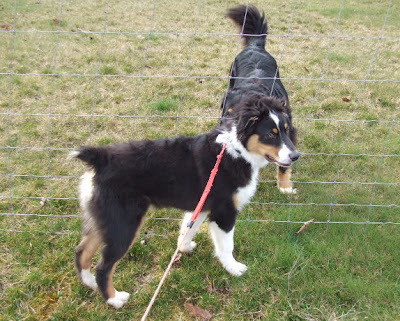 This is Jackson with his friend Sally; she lives at the beginning of our lane. 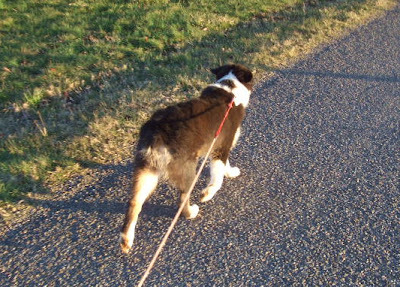 Every day that Jackson and I go jogging, he looks for his friend. When she comes to the fence to greet him, you can see "happy" written all over him! 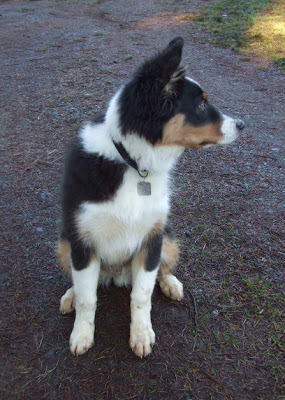 Below is a good full-body shot of Jackson; it's hard to get one as he's usually running towards me. 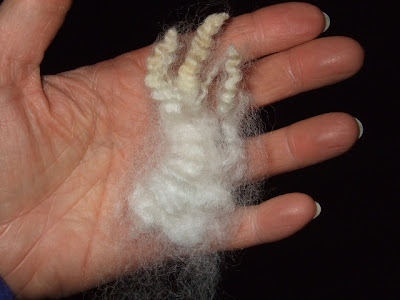 I have come to think of Kathy's sampler bag of fibers as a fibery "Reader's Digest;" an interesting collection of short, informative pieces that entertain and educate me without requiring a huge commitment of time. I love it! 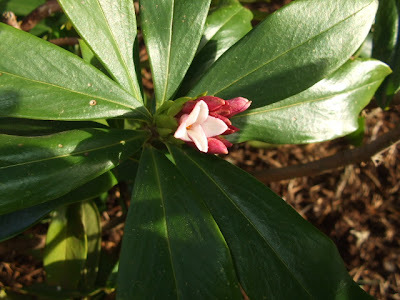 The purple crocus in my front bed are now out in all their glory: And while they aren't showy, these daphne odora blossoms that just started opening up today emit my very favorite scent in all our landscaping. I wish I could put a "scratch and sniff" spot on your computer screen so you could experience it, too! After finishing up several smaller gift knits recently, the only thing I had on the needles was the "scarf of miserable yarn." I know I'm going to love using this scarf when it's finished, but working on it is an exercise in discipline. I must use my reading glasses and pay attention; it is not a relaxing or mindless knit. 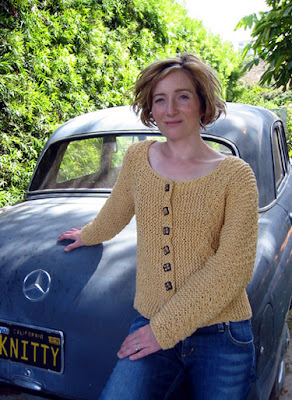 I've been itching to knit a sweater or cardigan for myself - I've had my eye on this Tubey for quite some time. 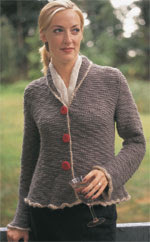 Then Interweave Press released the Sophisticated Rustic Jacket as a free pattern in their knittingdaily e-newsletter, inspiring me to go on an eBay yarn quest to find some suitable thick-n-thin yarn for it. I did find some for the main color, but it took forever to arrive. 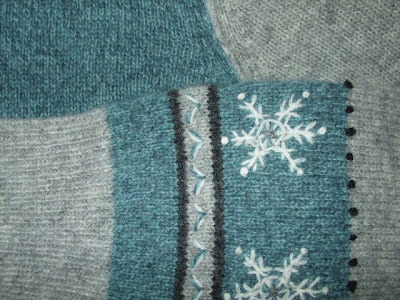 While waiting, I asked a couple lists for ideas on how to do vertical stripes without the heavy results of Fair Isle, and side-to-side knitting was suggested as a possibility. 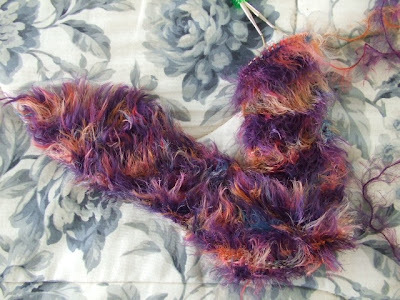 Having never heard of this technique, I did a search on Knitty.com and up came Sonnet -- and I instantly thought of the recycled sari silk yarn I have in my stash. I've been wanting to make something with the colorful stuff but the only thing I've seen anyone else make with it is a handbag. The Sonnet "recipe" looked like it would work, so abandoning my thoughts of vertical stripes I did the gauge swatch and jumped in. 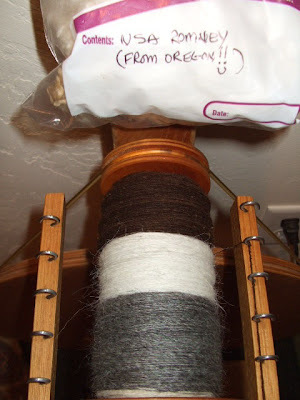 The first skein went fast. I eliminated the box stitch in the recipe since this yarn is busy enough without the added pattern. It is also incredibly "trashy" (the yarn)! I've taken to knitting with a towel in my lap to catch all the VM that falls out or I pull out - not just bits of chaff and hay but even small twigs! 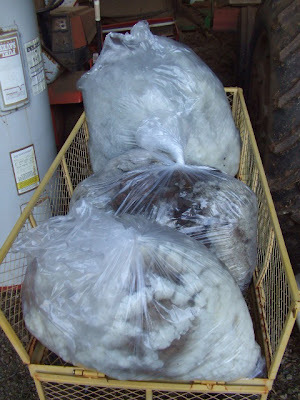 I can't imagine how so much "stuff" got in this yarn, unless the old saris were just piled on the ground and were spun from there. I hope the resulting cardigan doesn't have too many "pokeys" to be wearable. 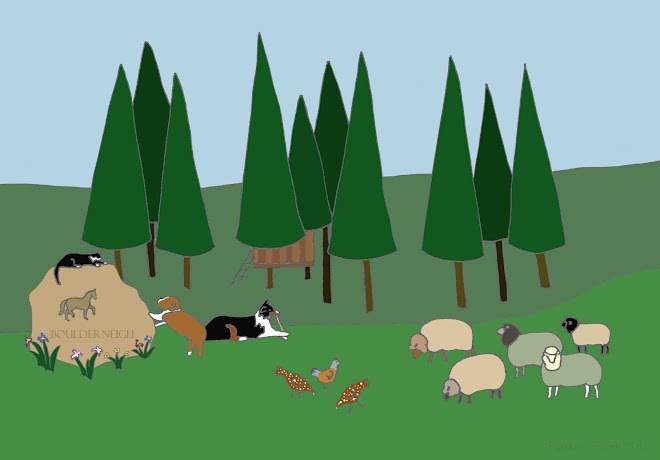 That's the knitting news for now from . 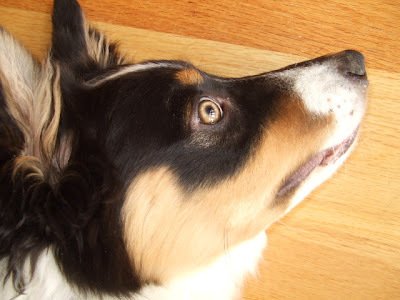 . .
A couple posts ago, Becky commented on Jackson's eyes and wondered what color they are. They match his tan markings, so I guess they are tan! 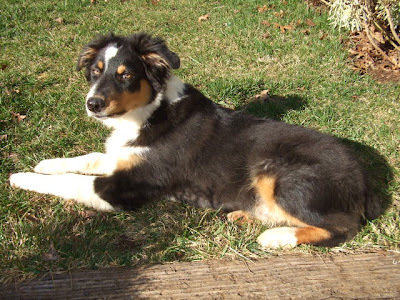 There is probably a more accurate term in "Australian Shepherdese" but I don't know what it is. 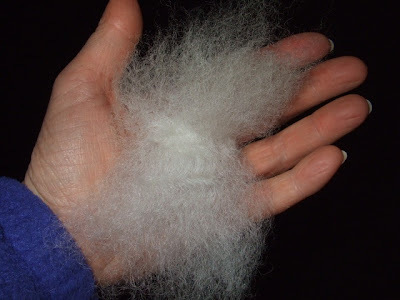 I'm still making good progress through Kathy's sampler pack of fiber. 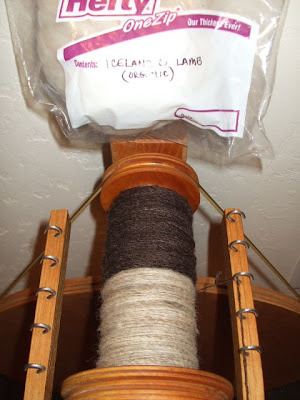 I finished the organic white Icelandic lamb, and then the gorgeous grey Gotland, which reminded me a lot of Bill Withers' mohair that Lauren sent me. I have since started the white Navajo-Churro shown in the baggy in the second photo. 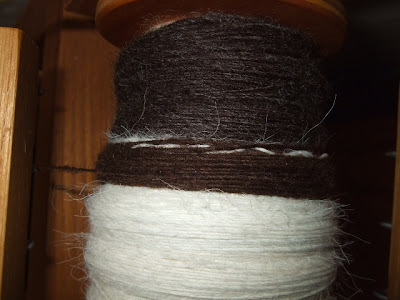 Who knew you could spin horse hair? That is really what this Navajo-Churro is like! 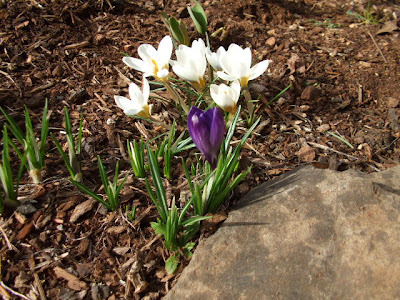 Today a purple crocus joined the white and yellow ones in my front flower bed. 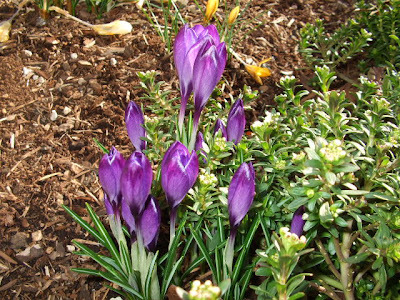 As much as Jackson has tromped through and dug up these poor bulbs, it's amazing to me that there are any blooms at all! Tonight Rick and I had a rare date. For Christmas I had given him tickets to see Gaelic Storm, the Irish band made famous by their appearance in the movie Titanic, at the Historic Elsinore Theater in Salem. My friend Pam agreed to babysit, and Rick's schedule book was blocked off at the end of the day. It has been relatively slow in the horse vet business lately, so we were looking forward to dinner and an entertaining evening out. But before Rick could get home to pick me up, three emergencies called in. He dashed out to take care of one of the horses, dealt with the second on the phone, and referred the last case to another clinic. So much for a leisurely dinner; we wolfed down a quick supper at Panda Express and made it to our seats in time for a great show. We were tapping our toes and enjoying the energy, when the case he had been dealing with by telephone paged him again. He stepped out and told the owner he was out of the area, and suggested she call another vet. By intermission he was paged again; both of the other area vets on call were out on emergencies, and the owner was desperate. The horse was in bad shape. What else could Rick do? 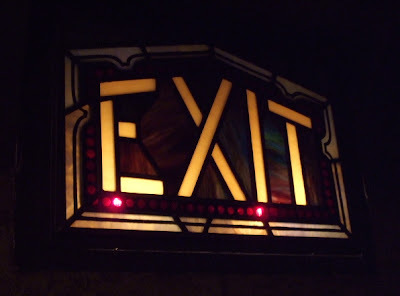 That's right; we left. He hasn't had three nighttime emergencies in three weeks, but the one night we have something planned, he gets three in one night. Such is the life of a large-animal vet. 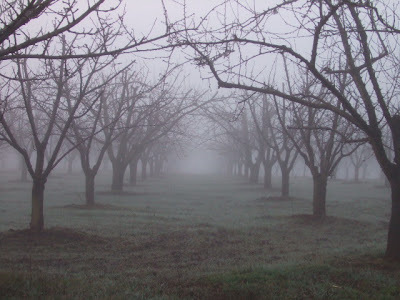 No sunrise visible this morning; we were socked in. 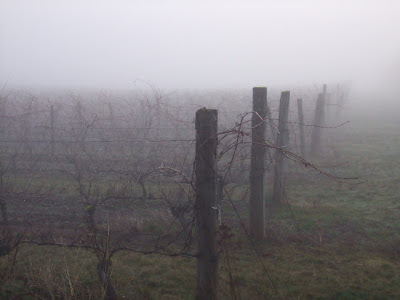 No matter; I love the way fog cloaks the familiar and makes it beautifully mysterious. Jackson and I pass this artfully painted shed every time we go jogging, but this morning in the fog, Jackson apparently saw the moose for the first time and perceived it as a threat. He's much more suspicious about new things and new people than other dogs I've had; he's definitely a "watch dog." 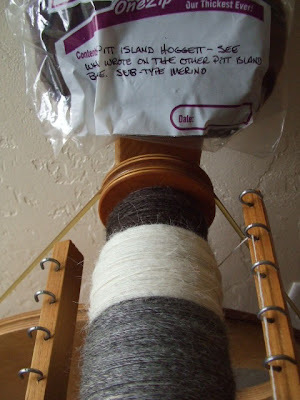 I finished the Pitt Island roving on Sunday (yes, the same day I started it -- woo hoo!) 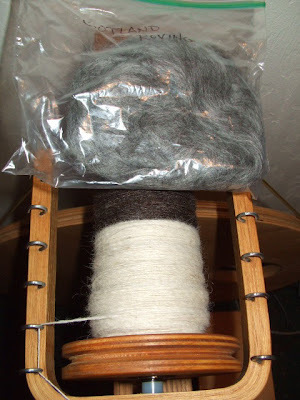 and selected the baggy of organic white Icelandic lamb roving to spin next. It's already half spun! Yesterday I stopped at Fred Meyer, which is, for those of you not familiar with this Northwest chain, like a Super Wal-Mart -- nearly everything under one roof. 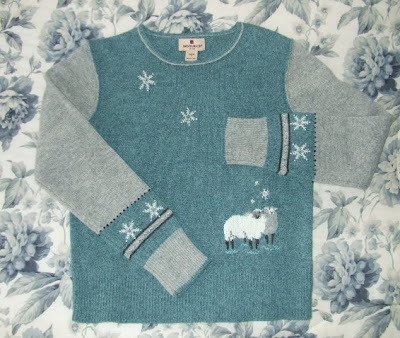 As I walked by the clearance clothing racks to get to the groceries, I saw a sweater with sheep on it. Of course I had to stop and look at it, but it was a size small. 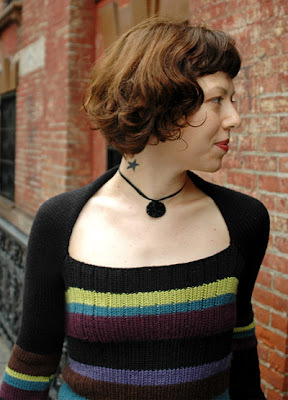 Oh well, I am on a self-imposed sweater-buying ban, because I can - and want to - knit some for myself. But it was really nice! I looked on the other racks to find a larger one, but no, that was the only one. I succumbed; into the shopping cart it went. I figured I could return it if it didn't fit (I had just worked with horses and was too dirty to try it on then.) But to my delight, it fits perfectly! "Really, Mom?" "Where is he?" I was planning to post an update on Jackson this week, but last night added impetus. When Rick came in from doing nighttime chores, he said, "Jackson needs a bath; Russell decided to roll him." Apparently my horse, who has heretofore shown no animosity towards our pup, suddenly took issue with a dog's presence in his paddock. Rick said Russell dove at Jackson face first and then spun around to kick him with his heels, but didn't connect solidly. Jackson was on his back in a corner, ki-yi-ing as only a hurt and terrified puppy can, when Rick intervened and soundly reprimanded Russell for his aggression. Thankfully, Jackson shows no sign of injury, AND I was able to get him cleaned up without the struggle of a tub bath. 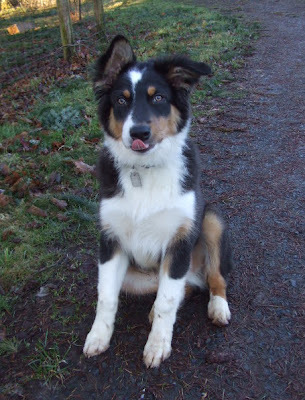 Even though this puppy is a handful and keeping ahead of the damage to person and property that his incessant chewing and biting can do is a full-time job, I'd hate to lose my jogging buddy. "I lick - er, like - you, too, Mom."